Complexity: what does it mean? How do we define it? This is an impossible task because complex systems are systems that defy definition. Our science that attempts to understand such systems is incomplete in the sense that a complex system behaves in ways that are unpredictable. Unpredictability does not mean that these systems are disordered or chaotic but that defy complete definition. The best definition I have heard recently is from Jeff Johnson at the Open University who at a meeting I attended (17th June 2011) defined them as “systems that have the potential to reconfigure themselves in ways that may be surprising”: in short, systems where this reconfiguration cannot be traced to the action of one single agent whose purpose it is to determine such change. A single agent may be able to reconfigure a complex system but the potential still exists for the system to change without us knowing the actions of any particular agent. Cities in many ways are the greatest exemplars of complex systems. They build from the bottom up, they grow organically, and they look as through they are created by nature in terms of the way their networks deliver energy to their parts. In so far as they are planned, such planning is dwarfed by the actions of millions operating from the bottom up. This web site is about the kind of science that is relevant to their understanding and systems theory some 50 years ago and now complexity theory is central to this. 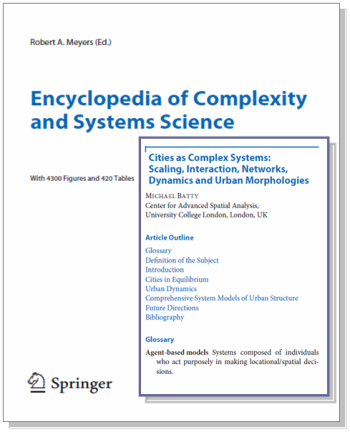 The Encyclopaedia noted above is highly relevant and you can download my own contribution to this which is quite a detailed article on all kinds of methods and models that come up on various pages on this web site. There is a bit of history here and also a lot of information about models and fractals and networks in cities. You can download it here. Click on the cover above left.